Hanshew, D. B., head-of-household, age 38, born in Virginia; parents born in Virginia; owned home; occupation: traveling salesman. Hanshew, Beula, wife, age 29, born in Virginia; parents born in Virginia. Hanshew, Mildred, daughter, age 10, born in Virginia; parents born in Virginia. Hanshew, Herman, son, age 8, born in Virginia; parents born in Virginia. Hanshew, Robert, son, age 6, born in Virginia; parents born in Virginia. Hanshew, Hazel, daughter, age 4, born in Virginia; parents born in Virginia. Hanshew, Ralph, son, age 1 month, born in Virginia; parents born in Virginia. 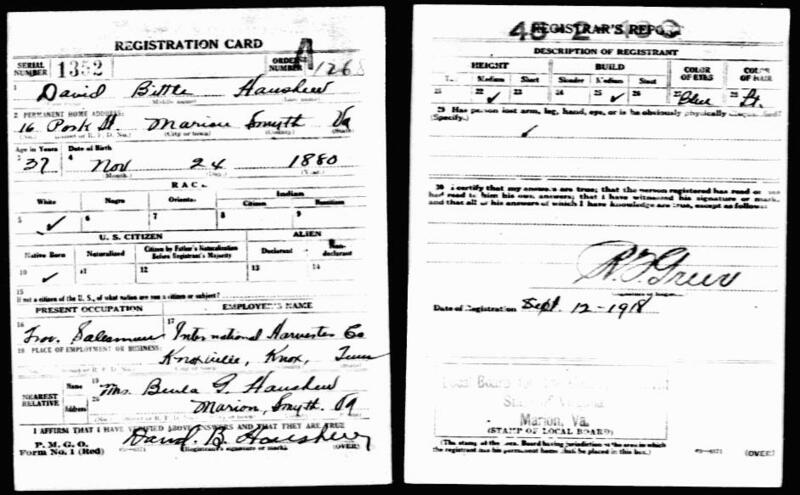 Hanshew, Bittle D., head-of-household, age 48, born in Virginia; parents born in Virginia; married, first married at age 27; owned home; no radio in home; occupation: farmer, general farming; not a veteran. Hanshew, Herman V., son, age 18, born in Virginia; parents born in Virginia; occupation: labor, on farm. Hanshew, Robt L., son, age 16, born in Virginia; parents born in Virginia; attended school. Hanshew, Hazel I. [or J. - unclear], daughter, age 14, born in Virginia; parents born in Virginia; attended school. Hanshew, Ralph P., son, age 10, born in Virginia; parents born in Virginia; attended school. Hanshew, Edith L., daughter, age 8, born in Virginia; parents born in Virginia; attended school. Hanshew, Ernest H., son, age 5, born in Virginia; parents born in Virginia. Hanshew, Joseph B., son, age 3 years 3 months, born in Virginia; parents born in Virginia. Hanshew, Marion R., son, age 11 months, born in Virginia; parents born in Virginia. 1920 census, Marion, Smyth County, Virginia; roll T625-1914, ED 114, page 8B, line #40, dwelling #178, family #178. 1930 census, Olympia Precinct, Smyth County, Virginia; roll T626-2461, ED 11, page 4B, line #70, dwelling #69, family #76. Obituary of Edith L. (Hanshew) Stephenson. 1920 census, Marion, Smyth County, Virginia; roll T625-1914, ED 114, page 8A-B, line #49, dwelling #170, family #170. 1930 census, Olympia Precinct, Smyth County, Virginia; roll T626-2461, ED 11, page 4B, line #98, dwelling #73, family #80.